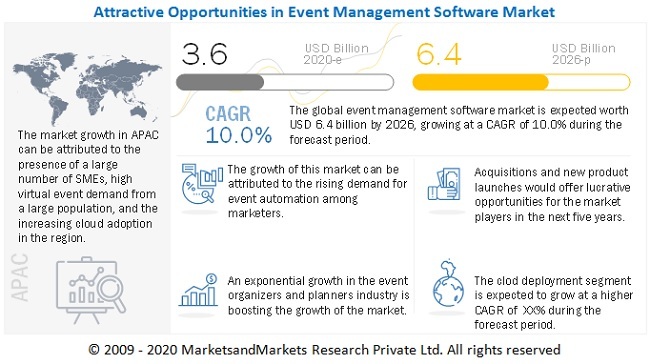 [155 Pages Report] The global event management software market was valued at USD 5.10 billion in 2017 and projected to reach USD 10.57 billion by 2023, at a Compound Annual Growth Rate (CAGR) of 11.6% during the forecast period. The forecast period has been considered from 2018 to 2023, while 2017 has been considered as the base year for estimating the market study. The main objective of this report is to define, describe, and forecast the event management software market by component (software and services), deployment type, organization size, end-user, and region. The report provides detailed information regarding the major factors (drivers, restraints, opportunities, and industry-specific challenges) influencing the market growth. The report forecasts the market size with respect to 5 main geographic regions, namely, North America, Europe, Asia Pacific (APAC), Middle East and Africa (MEA), and Latin America. The report profiles the key players and comprehensively analyzes their core competencies. This report also tracks and analyzes competitive developments, such as mergers and acquisitions, new product developments, and Research and Development (R&D) activities in the market. The research methodology used to estimate and forecast the event management software market began with collecting and analyzing data on key vendor product offerings and business strategies from secondary sources, such as OneSource Business Browser, D&B Hoovers, 10K Wizard, Bloomberg, Thomson StreetEvents, Factiva, IT service providers, technology providers, press releases and investor presentations of companies, whitepapers, technology journals, certified publications, articles from recognized authors, directories, and databases. The vendors’ offerings were also taken into consideration to determine the market segmentation. The bottom-up procedure was employed to arrive at the total market size of the market from the revenue of the key market software providers and service providers. After arriving at the overall market size, the total market was split into several segments and subsegments, which were then verified through primary research by conducting extensive interviews with key people, such as Chief Executive Officers (CEOs), Vice Presidents (VPs), directors, and executives. The event management software ecosystem comprises vendors, such as ACTIVE Network (US), Arlo (New Zealand), Attendify (US), Aventri (US), Bizzabo (US), Certain (US), Cvent (US), EventBank (US), EventBooking (US), Eventbrite (US), EventGeek (US), EventMobi (Canada), EventPro (Canada), eventuosity (US), Eventzilla (US), Gather Technologies (US), Hubb (US), Hubilo (India), Meeting Evolution (US), Regpack (US), SignUpGenius (US), Social Tables (US), Ungerboeck Software (US), Whova (US), and XING Events (Germany). MarketsandMarkets expects the global event management software market size to grow from USD 6.10 billion in 2018 to USD 10.57 billion by 2023, at a Compound Annual Growth Rate (CAGR) of 11.6% during the forecast period. The increasing demand to capture actionable business insights from events and the growing adoption of social media platforms for event marketing are expected to fuel the growth of the market. The report segments the event management software market by component (software and services), deployment type, organization size, end-user, and region. The services segment is expected to grow at a higher rate, as event management services help event organizers in catering to the needs of end-users. In the services segment, the managed services segment is expected to grow at a higher CAGR during the forecast period. The cloud deployment type is expected to grow at a higher CAGR during the forecast period, due to various benefits, such as cost-efficiency, scalability, high computing speed, and reduced expenditure on Information Technology (IT) infrastructure. In the software segment, the analytics and reporting software segment is expected to grow at the highest CAGR during the forecast period, as it helps organizations identify and track the Key Performance Indicators (KPIs) of the overall management that is organizing the event. This software helps companies analyze their trends, changes, and variances in events, customer interests, ratings, pricing, and the number of attendees. This software also aggregates the data across various databases, including Customer Relationship Management (CRM), Enterprise Resource Planning (ERP), and data warehouse, which helps the organizations measure their business performance and market their events across the chain in real time. The analytics and reporting software helps event planners access and analyze both the demand and supply sides of the event and carefully plan the budget and forecast the participants for various events. 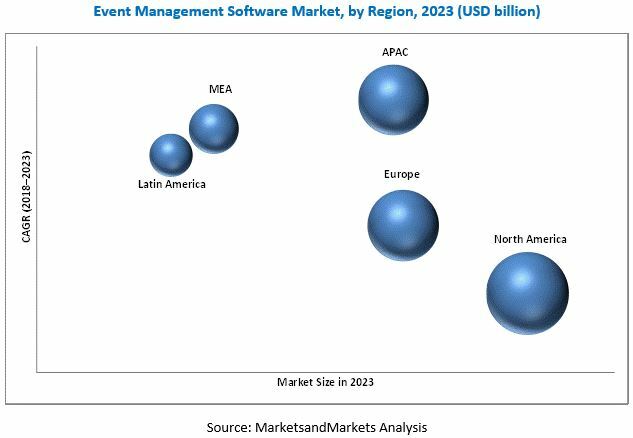 The global event management software market report provides region-specific analysis on 5 major regions: North America, Europe, Asia Pacific (APAC), Middle East and Africa (MEA), and Latin America. North America is estimated to be the largest revenue-generating region for the event management software and services providers in 2018. The region is an early adopter of new and emerging technologies, which results in the significant growth of the market. APAC is expected to be the fastest-growing region in the market, due to the technological advancements and digital transformation initiatives taken by enterprises to automate the entire event management software life cycle. However, integration issues may hinder the growth of event management software market. The major vendors in the event management software market include ACTIVE Network (US), Arlo (New Zealand), Attendify (US), Aventri (US), Bizzabo (US), Certain (US), Cvent (US), EventBank (US), EventBooking (US), Eventbrite (US), EventGeek (US), EventMobi (Canada), EventPro (Canada), eventuosity (US), Eventzilla (US), Gather Technologies (US), Hubb (US), Hubilo (India), Meeting Evolution (US), Regpack (US), SignUpGenius (US), Social Tables (US), Ungerboeck Software (US), Whova (US), and XING Events (Germany).